Are We Justified by Faith and Works? No! Many people misunderstand the words of James the Apostle because they don't know their Bible well. I don't think I've received even one letter of debate from a Catholic who didn't bring up the words of James, "Yea, a man may say, Thou hast faith, and I have works: shew me thy faith without thy works, and I will shew thee my faith by my works" (James 2:18). James goes on to say in verse 24, "Ye see then how that by works a man is justified, and not by faith only." At first glance, it sure does seem like the Bible is requiring works for salvation; BUT, as you will see, nothing could be further from the TRUTH! Carefully notice James 2:21, "Was not Abraham our father justified by works, when he had offered Isaac his son upon the altar?" This event took place in Genesis 22:8-10. Now notice Genesis 15:6, "And he believed in the LORD; and he counted it to him for righteousness." The event which took place in Genesis 15:6 was different from the event which took place in Genesis 22:8-10. We see in the New Testament that Paul spoke of the ROOT of Abraham's faith; BUT, James spoke of the FRUIT of Abraham's faith. We read in Romans 4:3, "For what saith the scripture? Abraham believed God, and it was counted unto him for righteousness." 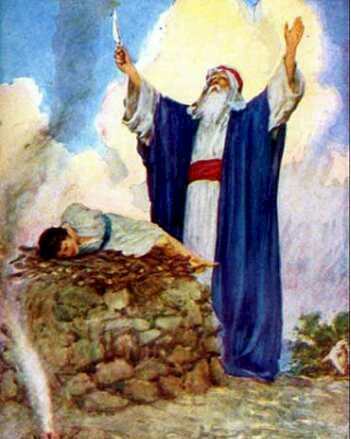 This occurred in Genesis 15:6, which is when Abraham was born again. Paul said in Romans 5:1, "Therefore being justified by faith, we have peace with God through our Lord Jesus Christ." Paul doesn't mention works. Romans 4:5 declares, "But to him that worketh not, but believeth on him that justifieth the ungodly, his faith is counted for righteousness." Yet, James declares in James 2:21, "Was not Abraham our father justified by works, when he had offered Isaac his son upon the altar?" This event took place years later, when Isaac had grown at least old enough to speak clearly to his father (Genesis 22:7). James is simply saying that if a person is genuinely saved by faith, then there should be some FRUIT (good works) in that person's life to show it. BUT, James was NOT teaching that works are necessary to be saved--they aren't! Abraham was saved by faith ALONE! Titus 3:5 clearly states, "Not by works of righteousness which we have done, but according to his mercy he saved us..."
Also, notice carefully James' words, "...shew me thy faith without thy works, and I will shew thee my faith by my works" (James 2:18). With God we are justified by FAITH; BUT with men we are justified by WORKS. The reason is simply because mankind cannot see out heart; but God can. We read in 1st Samuel 16:7, "...for the LORD seeth not as man seeth; for man looketh on the outward appearance, but the LORD looketh on the heart." James said, "shew me" your faith and I'll "shew you" my faith. Every believer possessing the Holy Spirit of God should be a new creature in the Lord, "Therefore if any man be in Christ, he is a new creature: old things are passed away; behold, all things are become new." This is what James was looking for. So don't let any Catholic fool you into believing that you must have good works to go to Heaven, you don't. Looking at the Old Testament by itself, I would never have any reason to think that Lot was a Christian. Yet, we read in 2nd Peter 2:6-7, "And turning the cities of Sodom and Gomorrha into ashes condemned them with an overthrow, making them an ensample unto those that after should live ungodly; And delivered just Lot, vexed with the filthy conversation of the wicked." Did you read that ... "just Lot"? James was simply teaching that there should be some good works in a Christian's life to back up his testimony. However, this doesn't mean conclusively that a professed Christian without any good works is not saved. We certainly have a right to question their salvation; BUT, we cannot say for certain because we cannot see their heart. King David killed an innocent man (Uriah) to hide an unwanted pregnancy from an affair with the man's wife (Bathsheba). Would you have thought David was a Christian at that moment? Of course not! But David was a Christian, who had sinned horribly. The Book of James should be a challenge to every believer to "Let your light so shine before men, that they may see your good works, and glorify your Father which is in heaven" (Matthew 5:16). And the Book of Romans should be a challenge to every believer to be aggressive in winning lost souls to Christ, "For I am not ashamed of the gospel of Christ: for it is the power of God unto salvation to every one that believeth..." Most importantly is that we NOT confuse the ROOT of our faith, with the FRUIT of our faith--because ADDING works to faith is a sure road to Hell.